I think it's safe to say that Nigeria is gradually getting out of the economic recession. The Naira has started gaining against the dollar and even banks have started lifting restriction on their debit card for international transactions. 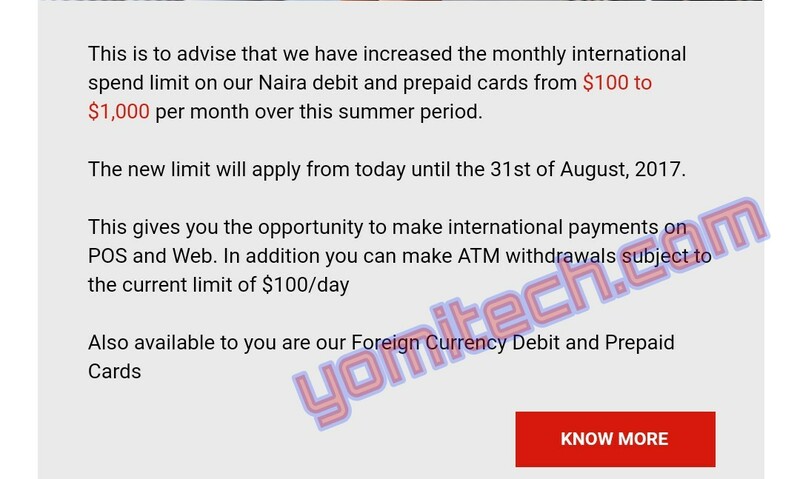 Few weeks ago, Ecobank officially lifted restriction on their naira debit card to $300 a day and $3000 a month, Gtbank also followed by lifting the limit from the old $100 monthly limit to $1000 monthly limit. Now UBA have decided to follow the trend. If you happen to be a UBA customer, you can. now use your Naira debit card and prepaid card to shop internationally to up to $1000 in a month. Also, you can withdraw with your naira ATM card in any part of the world but with a limit of $100 a day. Unfortunately, this new limitation by UBA is only for a short period of time as it will only last from now till the 31st of August 2017. For those who might want to use their UBA card for online payments, note that the current exchange rate is around N385/$.